You can expect major changes in your body with our classes. You'll burn tons of calories, guys build muscle while girls get toned, and in general, you get your metabolism kicked into high gear. Our work-outs are a great way to help you shed those unwanted pounds. Additionally, you'll reshape your body. Your arms, legs, but and waistline are going to become more toned. . .stick with it long enough and guys may even develop those six pack abs every guy longs for while girls get the toned, lean look all the stars are raving about! Our programmes are designed to be positive and inspirational. We'll keep you motivated and thinking about progress and goals. Our staff and students are all success oriented and focused on looking for the good in all situations. You can expect to go home from class with renewed vigor and enthusiasm. It's true, adults who take martial arts Lessons from Family Martial Arts develop better self-confidence. You'll be encouraged to take chances, to push yourself further than you ever thought possible. The success you experience through our programme teaches you that you can be successful at anything if you truly believe you can. Improved confidence leads to better performance at work, a better circle of friends, better performance in sports and in extracurricular activities in general. Your improved self-confidence will help you deal with all of life's challenges with a more positive outlook. Family Martial Arts teaches two forms of self defence. One is physical - you will improve yours strength, flexibility, and overall health. Additionally, you will learn to strike with tremendous power and effectiveness. Hopefully, you will never need to fight. . .but should the occasion arise, shouldn't everyone know how to protect themselves? 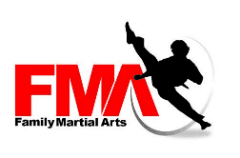 The second form of self defence martial arts Lessons at Family Martial Arts teaches is internal. Our students learn to spot danger and avoid dangerous people, places and activities. Martial Arts Lessons can help you avoid the need for a physical confrontation. This second form of self defence is perhaps the most valuable of the two. Family Martial Arts Academies curriculum combines techniques and principles from a variety of Martial Arts styles including Karate, Thai Boxing, Kickboxing, Taekwondo, Jeet Kune Do, MMA, Brazilian Jiu Jitsu, Combat Submission Wrestling, Catch Wrestling, Filipino Martial Arts, Real Combat System and Krav Maga to provide you with the best self-defense system possible. Most styles focus on one area. Our hybrid approach gives you the edge and the ability to protect yourself in any situation. And the great news is you will be learning these styles and systems through direct lineage from the Legends that created them! And physical benefits are just the beginning. You’ll develop mental skills as well. You’ll be more focused and competitive both in your career and your personal life. You’ll perform better, feel better, be better. But… is it a good workout? You bet it is. You’ll get into the best shape of your life. Our program is a total fitness package combining strength, stress relief, endurance and flexibility. We use the latest technology and techniques, combined with martial arts wisdom that’s thousands of years old. We’ll develop your muscular systems, build strength and chisel out definition. And if that doesn’t sound like enough. You also get cardiovascular and metabolic conditioning that evaporates calories. The result is a tremendous increase in energy and stamina. Work out with a purpose. Stop doing the same mindless exercises at the gym. Take control of your mind and your body. And as a bonus, learn the self defense skills that could save your life. Fill out the form below NOW!